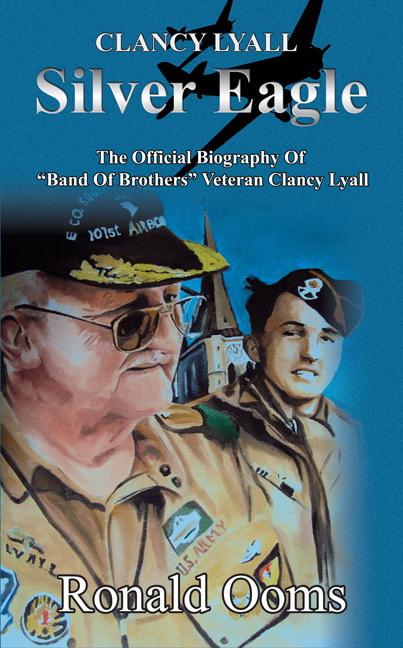 The official biography of Clancy Lyall, member of the “Band of Brothers”, made famous by Steven Spielberg's and Tom Hanks' 2001 TV-series and Stephen Ambrose's book bearing the same name. It's Clancy's story in his own words about World War 2, Korea and Indochina, as he witnessed it. Written by his close friend, journalist Ronald Ooms. Ronald Ooms is a 34 year-old Belgian author. He worked for almost a decade as a youth worker for numerous socio-cultural non-profit organizations. Since his childhood he has been interested in everything related to World War II thanks to the stories told by his grandparents. For more than a decade he travelled to historic places relating to the War whenever possible. Some years ago he became a qualified journalist and started to write for a local newspaper. His close friendship with Clancy Lyall over the years resulted into the writing of the book, Silver Eagle. He's also got a passion for motor-sports and hopes to write something about F1 Racing one day. Ronald is available for interviews, even abroad. Should the distance be too far or he can't make the trip, he would gladly do a telephone conference. He resides in the city of Geel in the north of Belgium.